I haven't posted a crucifix for a while (been in Auckland, have other things come up to post about) so here's a return to a bit more consistence on Sundays. 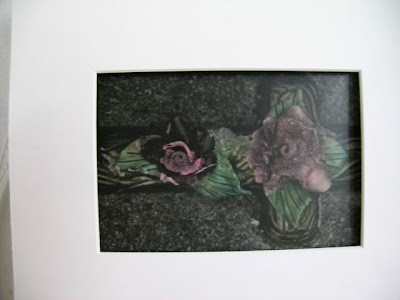 This is hand-coloured silver gelatin photographic print I swapped with a student a year and a bit ago. I think her name was Jascinda, taking fashion design , but she took a photography workshop to get some extra credits. I thought it a beautiful example of traditional hand-colouring. She could have easily got a job as a White's Aviation tinting artist. I swapped this for a small HMV Dog painting that she selected. I've started becoming more interested in 2-d images of crucifixes, especially photographs, as they often have more information around the outside of the cross, the context, which adds to the where, when and why; the intentions of the photographer and the subjects surroundings.